As I opened the pantry door in an effort to clean and organize it…I realized this. We have seven open boxes of cereal. I can’t be the only one with seven ongoing boxes of cereal in their pantry, can I? How many boxes do you have? WE made a rule in the house, “DO NOT open another box of cereal unless the last one is EMPTY” They don't exactly always follow it, but it helps some. 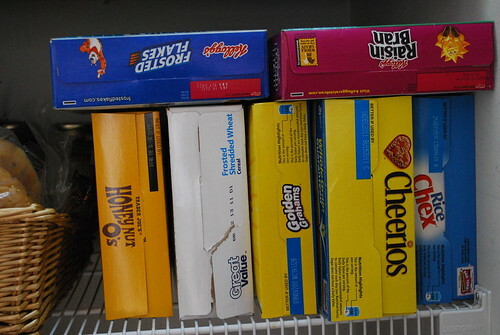 We only buy two kinds of cereal, so we never have more than two boxes open. But we also put our cereal into storage containers instead of keeping it in the original boxes. Sadly three.lol and get this there aren't any kids at our place. Right now we have 6, but that's because there are 2 empties next to the trash can. When you have school age children cereal is a staple – it just is. I know. I had a bowl of raisin bran for dinner last night. I'm not complaining, but it made Mr laugh this morning! zero boxes here. I always forget about breakfast cereal. I guess I never liked it that much. Besides, I have too small of a pantry. I usually make a hot breakfast, or a smoothie in the summertime. 3 and each is basically about 2/3 finished. Four boxes, which considering the limited pantry space I have, is criminal! Zero. We don't eat cereal. I know, right? 10 families in America do not eat cereal and we're one of them. Just counted…5! That's pretty good for us. We have 2. One that dh eats in the morning and cheerios for the baby. I don't eat cereal (blech! ), and I've trained my kids to not like it either. Not exactly the best move I ever made. It would make mornings a lot easier. I gave up on cereal. It's like Chinese food – I eat it and an hour later I'm hungry. My kids would always open all the new cereal boxes within a day or two of me buying them, and never go back to the old ones because that cereal was “stale”. After 25 years of child-rearing I finally have them trained to open only one or two at a time, and now they are all moving out on their own. Go figure. I only allow 3 boxes to be open at a time. I am the meanest mom. Oh my gosh, i just counted ours and we have 9 open boxes and one unopened box! I think I'll have to go through them. 5. I just looked cuz I thought I might beat you. HA! Three, but we have been known to have more. Have a cereal buffet for dinner one night! Defintely more than 7. If I buy a new ceral, the kids head for it immediately!